It is a well known fact that money only motivates people to a certain level, beyond that it has little effect on improving performance and participation in an organisation. However, public recognition can provide measurable productivity and engagement improvements. 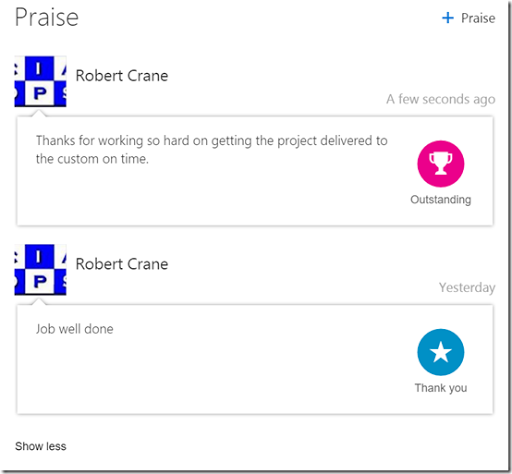 As you can see from the above image the ability to praise people has arrived in my Office 365 tenant. Where do you find it this option? The ability to provide praise is found in Delve. Once you have navigated to your Delve you select the individual you wish to praise from the list on the left and then their profile page on the right. In the lower right of their profile page you will find an area, as shown above, in which you can add public praise for that individual. If there is already praise there you will see it listed, as shown above. To add praise simple select the +praise link on the right. When you do a new choice slide will appear from the right as shown above allowing you to enter text and select at suitable “badge” to go along with your praise. Once the praise has been saved you will see it added to any praise that has already been bestowed. 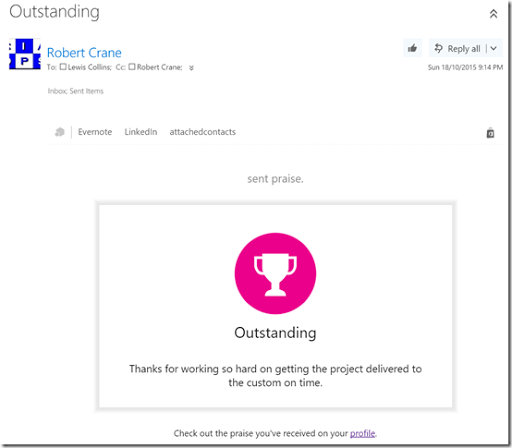 The user awarding the praise, as well as the person receiving it will receive an email informing them of the award. I think this is a really great addition to Office 365 and shows to me that Microsoft is really thinking about ways to boost users productivity with Office 365. However, what concerns me is the lack of awareness of these types of features. 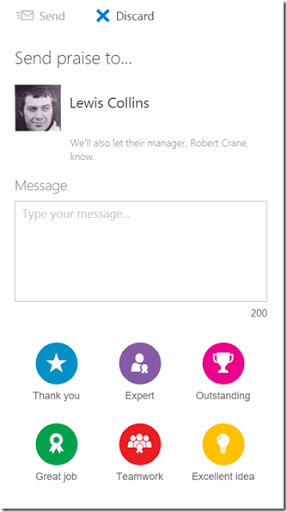 Features like praise are a free addition of every Office 365 tenant and should be an opportunity for resellers and IT Pros to go to their users and highlight the new included feature and help the customer understand how it can be used to improve their business. Unfortunately, I don’t see many IT Pros or resellers helping their clients use these new features, let alone even being aware of them. That is a sad state of affairs and really devalues Office 365 and the features that it provides because 80% of the features of Office 365 remain unknown to customers. Most Office 365 implementations I run across from other providers are simply just using it for hosted email even though they have access to the full suite of services such as SharePoint, Skye for Business, Yammer, etc. 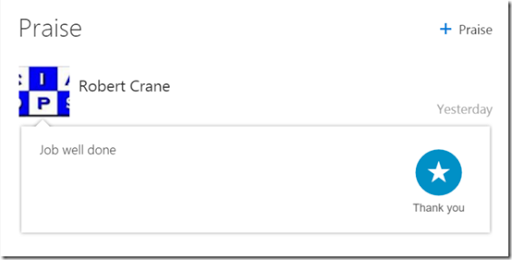 as part of their Office 365 subscription. It’s time for those that claim to be Office 365 IT Pros and resellers to truly embrace the length and breadth of the product. It is time for them to invest in understanding not only what the Office 365 product can do but also how it can help their customers business. Failing to let clients know about free additions to Office 365 like PowerBI, Azure Single Sign On portal and so on is simply a path to oblivion in the modern IT world. Wake up and start using Office 365, the WHOLE of Office 365. If all you are doing for your customers is moving email from one location to another and NOT adding value you are going to struggle to remain valid to the customer. 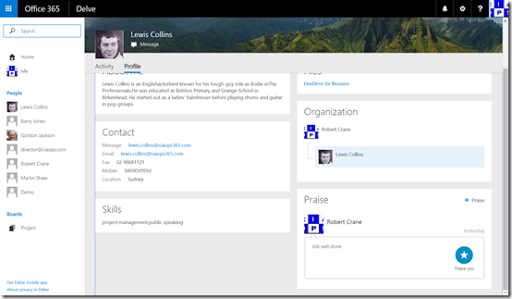 Office 365 offers so many opportunities to engage with customers and build unique products and services. If you don’t someone else will and if the customer is already on the Office 365 platform they have a standard platform to work with already. You have in fact made it easier for your competition to trump you. At the very least, my call to action, is for you to start using Delve. Customers, ITPros and resellers, get to it now and use ALL the features the product provides.